The road trip is a state of mind. Expectations range from epic tales of pioneer wagon trains to station wagons and Chevy Chase. In literature, we dust off our sense of rugged individualism and get On the Road with Jack Kerouac. We’ve pined to reach new highs with Ken Kesey and his magic bus, Furthr. Whatever the destination, in the final mile of any road trip, you rarely take the trip you thought you were going to take. I hooked up an Airstream and resolved to dedicate most weekends over the next twelve months to finding new experiences in the wilds of the Northwest. My wife made a list. My daughters packed bags. My head was in a Silver Cloud. Until this summer, my family’s typical road trip took on the redolence of a zoo. The minivan was packed to the windows and smelling of the prior trip. Was it camping at the coast or trekking in the Steens? Maybe just a ham sandwich. On the opposite end of the spectrum, the Flying Cloud Airstream is 25 linear feet of beauty dressed in a silver pencil skirt. It sleeps four easily—five if you push it—has a full shower, a separate WC, a full kitchen and a dining area. It’s tempting to channel the bravado of Airstream’s founder, Wally Byam, when whistling down the open road—good-looking, a war veteran and Stanford graduate. Young Byam, in the early twentieth century, tended sheep in Eastern Oregon near Baker City. He soon began to devise a better warming hut for cold nights at the base of the Blue Mountains. 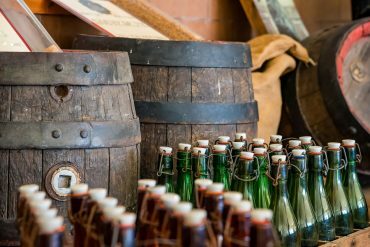 By the 1930s, Byam had moved into production with the trailer that would soon become a symbol of American adventure and the envy of anyone with good taste and yearning for travel. 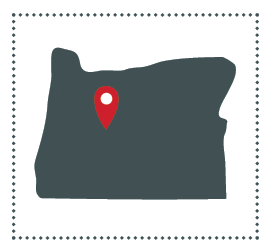 After signing a partnership with Airstream Adventures Northwest in May, we would have the honor of sharing Byam’s dream and Kerouac’s journey. “Nothing behind me, everything ahead of me, as is ever on the road,” Kerouac wrote as he launched into the heart of a post-Whitman America. “The best way to get to know your Airstream is to use it,” wrote the author of the Newbies Guide to Airstreaming. Stay close to home in case anything goes awry on the first Airstream foray. I took this advice to heart, remembering the last time I did anything like this. I borrowed my friend’s new van camper for an easy jaunt to the coast. Before my family was four hours into the trip, we had broken the recline mechanism on the driver’s seat, snapped the latch to the refrigerator and left the awning to be shorn in a coastal wind. 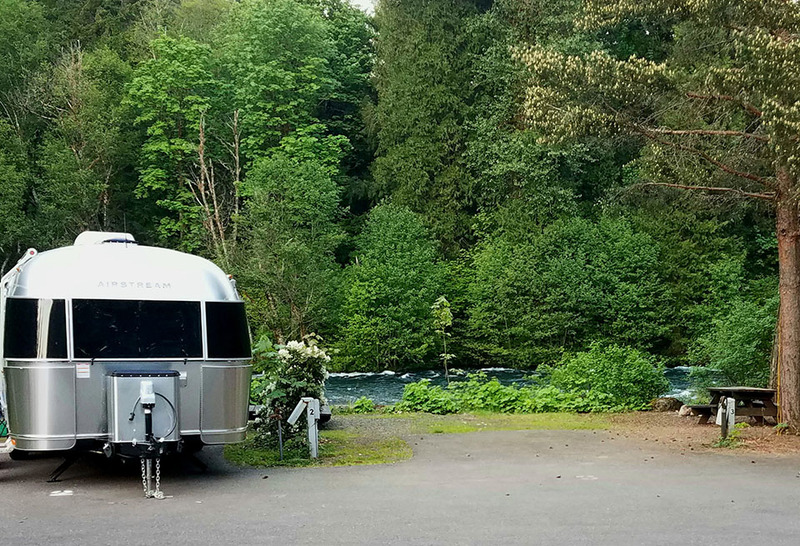 As I drove out of the parking lot at the Airstream dealership and made my way to the McKenzie River, I was beset with trepidation and determination to not repeat my errors. Was the hitch properly hitched? Does the width fit the width of the traffic lane? Is this really happening? Just a few more miles to Belknap Springs, where Sarah and her Swedish friend, Kristina, would be expecting me. They had just finished taking road bikes out on the McKenzie Pass Scenic Bikeway, a 76-mile out-and-back from Belknap Springs to Sisters that is one of fifteen scenic bikeways in Oregon. This was a pre-summer Wednesday, before the pass opened to vehicles. Sarah and Kristina, however, have the ability to gab, seemingly without breathing, on hill climbs while covering topics ranging from current events and old gossip to upcoming adventures and, of course, the odds of my unscathed arrival. I felt like Homer returning from his Odyssey as I pulled the aluminum trailer into Belknap Hot Springs. The lodge is a classic log and timber construction. The springs were developed into a large pool adjacent to the lodge. Most of the resort dates back to the 1860s when Rollin Simeon Belknap, originally a Vermonter, discovered the salt springs and laid claim to them with the intention of building a health resort. For my health, all I wanted was a good drink after a half-dozen attempts to reverse into the trailer slot. Some campers looked on in amusement and disdain, smirking from the shadows of their awnings and hoping I would fail. Then there are those people who want you to succeed. “Can I help?” A tan gentleman in board shorts, flip flops and a T-shirt stepped out of the lodge. He has had multiple Airstreams over the years and was happy to share his experience. 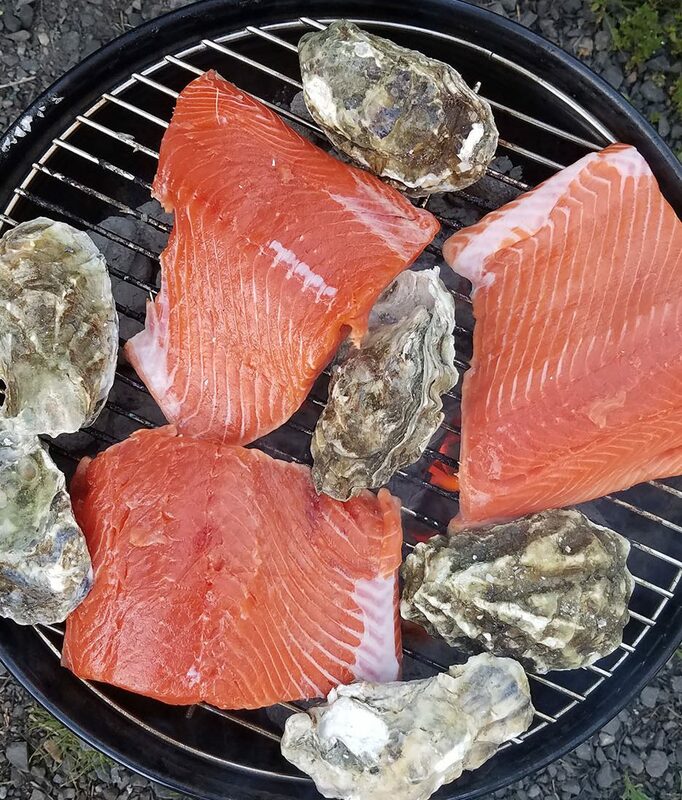 That night we grilled wild Alaskan salmon and oysters that I had packed back from Pike Place Market the day before. I opened a bottle of Oregon pinot noir and a rosé from Paso Robles, courtesy of the fellow Airstreamer. Ah, camping. 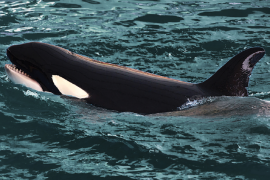 Lying in bed that night, I listened to the McKenzie roar past our camp on its 90-mile trek to the Willamette. 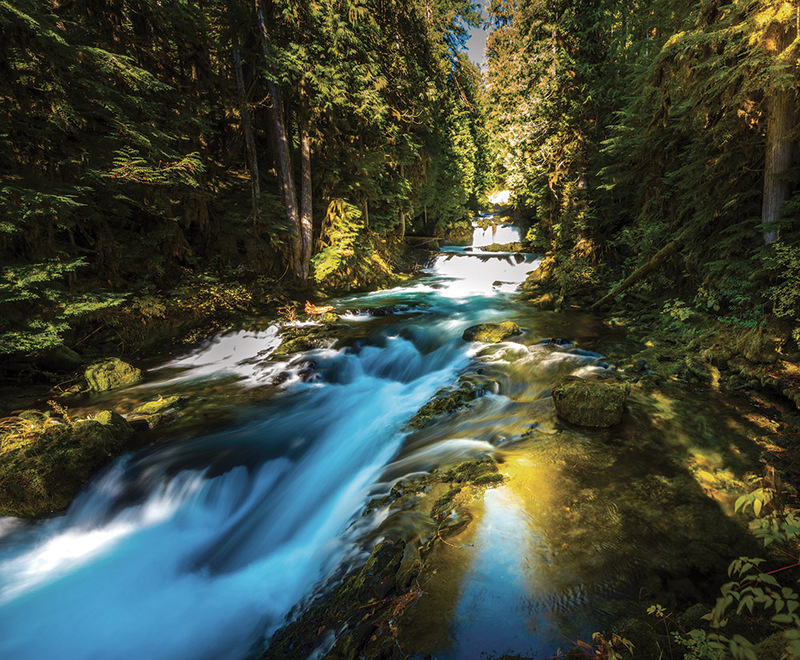 The McKenzie River Trail keeps 26 miles of adventure under its well-preserved canopy in the Willamette National Forest. Many call it one of the best mountain bike journeys in the country. Thankfully its remote location keeps the trail clear of amusement park warriors. 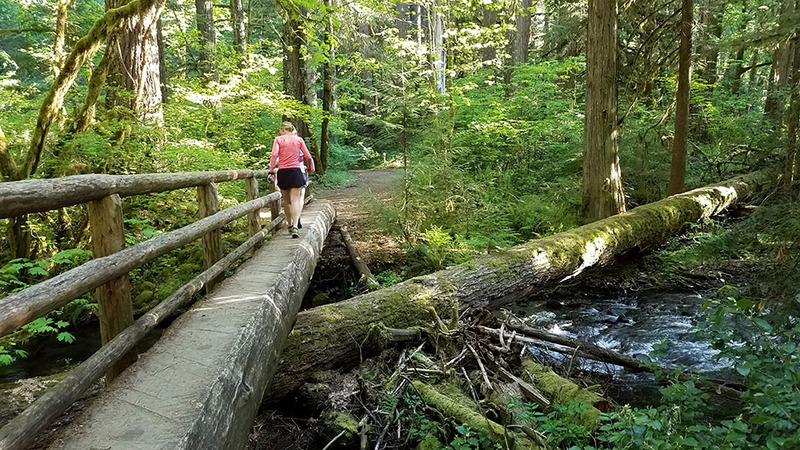 “Is there a Stawr-bucks nearby?” Pair this trail with a stunning road ride on the McKenzie Pass or the Aufderhiede – a ride that passes Cougar Reservoir and on to Oakridge—and you have the terrain for a two-wheel fantasy weekend. We camped well that night on high-thread-count sheets and got an early jump on the encroaching heat of the morning. We set out on a trail run, slashing through sunlight piercing the forest canopy. After 8 miles, we were back for a quick soak and ready to get back on the road. Forget the hot-dogs! Next time you're camping try grilled salmon and oysters. Grill these on a small tag-along hibachi. Salt the salmon generously and grill until center starts to flake when forked, approximately 10-12 minutes. Serve with a lemon wedge. At the same time, place oysters on the grill. Continue to grill until the oyster opens. If an oyster does not open, do not attempt to pry open and eat. 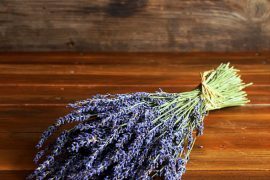 In a medium pot, heat 2 tablespoons of olive oil. Add couscous and stir to coat with oil. Cook for a couple of minutes or until couscous smells toasted. Pour in 2 cups of water and bring to boil, then decrease to a simmer and cover. 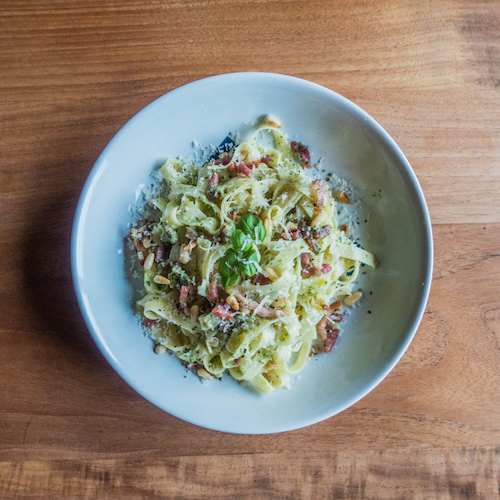 Cook for 10 minutes or until al dente. Drain and let cool. In a large bowl combine mint, tomatoes, cucumber, scallions and lemon juice. Once couscous is cool, fold the mixture into the couscous. 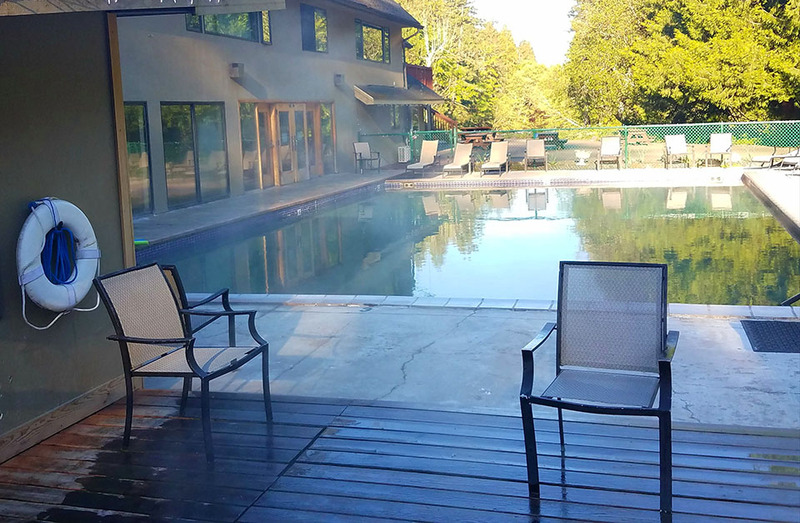 Most of the Belknap Hot Springs Resort dates back to the 1860s when Rollin Simeon Belknap, originally a Vermonter, discovered the salt springs and laid claim to them with the intention of building a health resort. Soak in the hot springs at Belknap. Ride, run or fish some portion of the McKenzie. Spotty, but adequate near the lodge. Thanks Martin! Hope you’re having a great summer!